13 pages - Full colour calendars, printed single-sided onto 170gsm gloss or matt art paper. Spiral wire bound on top edge with a 300gsm card fold out 'tent' style support. These calendars fold flat for easier mailing. 7, 13 and 14 page options are available for desktop calendars. We also offer CD case calendars and Booklet calendars. Printed full colour one-side onto 170gsm matt art paper. Wire spiral bound on top short edge with thumb cutaway and hanger - 13 sheets plus cardboard backing sheet. one-side or both-sides. 13, 14 and 15 pages are also offered. Many other sizes and quantities available. Also CD case calendars and flat sheet calendars. Calendar pages can be printed either 1-side only or both sides. A6, DL and square sizes are also available. 13, 14 and 15 sheets are an option for wall calendars. 7, 13 and 14 sheet options are available for desktop calendars. 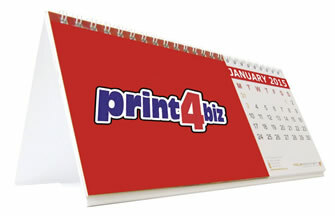 Print4biz - Bulk calendar printing prices. Calendars, year planners and wallcharts. Free proofs. Free mainland delivery. Free document check. Hanging calendars, tent calendars, desk calendars - spiral bound, glued, wiro bound and booklet styles available.